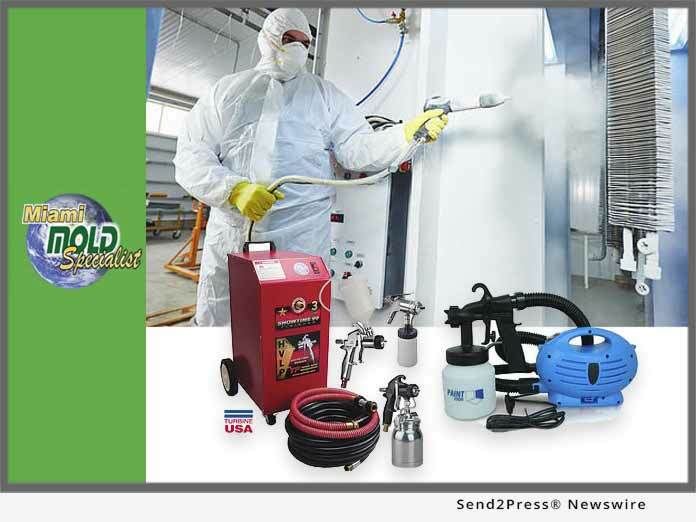 MIAMI, Fla. /Florida Newswire/ — Prominent South Florida mold removal and indoor environmental services company, Miami Mold Specialist, implements latest scientific breakthrough in mold prevention coating solutions. With mold awareness on the rise thanks to the media; home owners, renters, property owners, property management companies, co ops, condos, and real estate companies alike are now picking up the pace with investing in mold prevention, mold removal, and indoor air quality products, systems, and services as to mitigate future costs of repair, maintenance, and potential liabilities. Miami Mold Specialists offers a wide range of mold prevention services that are executed when completing most “all inclusive” mold remediation projects, such as – air scrubbing and disinfecting services, indoor air quality services, mold inspections, mold lab testing, HVAC mold removal and disinfecting services, 360 electrostatic disinfecting services, solar powered attic ventilation systems, leak and water proofing services, use of all natural and eco-friendly anti-fungal cleaners, along with their latest addition of a next generation, anti-fungal and anti-microbial coating solution. This all new anti-fungal and microbial coating technology that Miami Mold Specialists has acquired is applied to dissolve any remnants of mold, as well as, to prevent future mold growth after a mold removal project. This all in one anti-fungal, anti-bacterial, Near Zero ECO VOC coating technology works by killing off mold at the source, inhibiting condensation, and preventing mold and other harmful microbials from invading and taking control of a home or building. For more information on Miami Mold Specialists new line of anti-fungal/microbial coatings, please visit: https://www.miamimoldspecialists.com/exclusive-fungal-coating. South Florida’s Premier Indoor Air Quality and Mold Removal Service Provider – Miami Mold Specialist: High Tech and Eco Friendly Indoor Air Quality, Mold Inspection, 3rd Party “Conflict Free” Mold Testing, Mold Removal, Mold Prevention, and Water Protection Services by Miami Mold Specialist. Multi Certified, Licensed, Bonded, and Insured. Over 30 Years of Experience!